In an effort to clear my TBR bookcase more quickly, I, of course, picked up a few of the chapter books that I had sitting around. 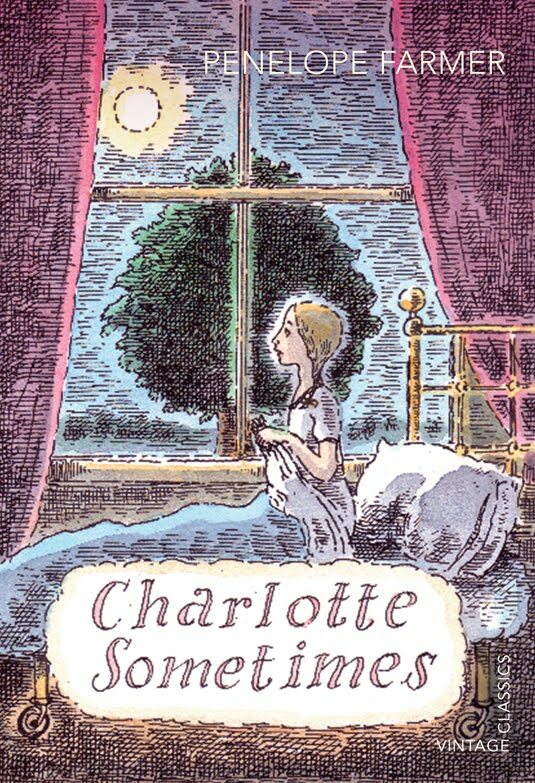 I mentioned Charlotte Sometimes by Penelope Farmer in my RMODB post last month but I wanted to sing its praises one more time. Charlotte heads off to boarding school and, as she is first in the dormitory, she gets her pick of beds. She decides on the one with the fancy wheels by the window and thus begins an unbelievable adventure. Every other morning, she wakes up forty years in the past, during the First World War, in the body of a girl named Clare. Once again I am going to lament that my suburban Southern California library didn't have a selection of British children's fiction for me to fall in love with when I was a kid. I don't know what last prompted this complaint but it might have been Tom's Midnight Garden or The Children of Green Knowe. These are all books that would have stretched my imagination and started my Anglophilia early. 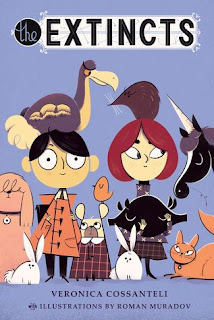 There are a lot of similarities between Eva Ibbotson's children's fantasies and they are, coincidentally, the things that make me love them the most -- a strong respect for nature, a distaste for spoiled, thoughtless people, and a belief in secret creatures. 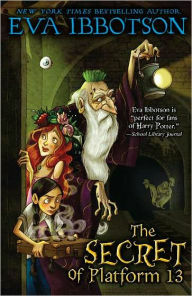 The Secret of Platform 13 is a simple story about an abducted fantasy-land prince and the attempt by a motley crew to rescue him from the horrid London home of an early version of the Dursleys. Ibbotson's books aren't the most complex but they are possibly the most thoughtful. I fall in love with her a little bit more with each sweet tale. This one wasn't technically on my TBR because it was an ARE but it was sitting unread in my house and so it eventually had to be read, right? The Extincts by Veronica Cossanteli delivers just what it says in the title, a whole bunch of amazing, supposedly extinct or very mythological creatures on a secret farm. George gets a job at Wormestall Farm and also makes a new friend -- Prudence, whose evil stepmother is an evil taxidermist who would love to get her horrid, evil hands onto the special creatures (to murder them and stuff them). Did you read any fun chapter books this summer? This is a good idea. I really should read some shorter stuff just to clear some space... Instead the summer for me is usually hardly reading! 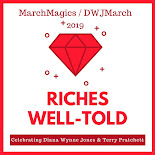 I have been reading the Worst Witch series - very short chapter books. I was looking for books for a "back to school" list and found these, which I had never read as a kid. Very fun, and the illustrations by the author are charming too. I haven't read them either but I know that they're well loved. Maybe I should try them! The first one is weak (the author was only 18!) but they get better. Nothing deep there, but they are cute and super fast reading. I do so love Eva Ibbotson, but her children's books have aged rather badly for me -- her hostility towards overweight people is so INTENSE and at a certain point it's hard for me to keep rooting for the heroes when the main quality of the villains is "fat." However I still love the ones of her kid-books that have snooty people as villains. Journey to the River Sea remains one of my utter favorites, and I remember enormous fondness for The Dragonfly Pool, although it's been a little while since I read it. I really think she uses "fat" in the place of the word gluttonous though. It's not good because of the stigmatizing of fatness but I think she just used it as the easiest way to show greed. I agree she could have been smarter about that. And Journey to the River Sea is amazing. I haven't read The Dragonfly Pool yet though so I'll look for a copy of that! I always feel a bit like Hermione, who knew nothing about the Tales of Beedle the Bard when I realize just how many awesome chapter books I missed out on as a kid. Charlotte Sometimes sounds amazing, what a great way to teach children about the first world war and get them to love history. Charlotte Sometimes sounds like just my kind of book. I miss picture books but definitely had more fun reading chapter books with Z!